Dark leafy greens: It's too hard to single out one over the other. Kale, Swiss chard, collard greens, and turnip greens are just a few examples of dark leafy greens. They're packed with iron, calcium, potassium, vitamin C and vitamin K. Simmer greens in water or other liquid, such as broth or wine. Try adding them straight to soups or stews, or steam greens and add them to pasta dishes. Avocado: Avocados contain monounsaturated fats, which can improve blood cholesterol levels. Plus, they're packed with folate, vitamins E, C and B6, potassium and fiber. Slice avocado and top sandwiches, salads, tacos or toast. Blend into smoothies or hummus. Broccoli: Broccoli is a member of the cabbage family and contains phytonutrients, which have significant anti-cancer effects. Broccoli is also a good source of beta-carotene (converts to vitamin A), vitamin C, calcium, potassium, folate, and iron. Steam or roast in the oven, use in a stir-fry, egg dish or pasta. Choose a natural green food for St. Patrick's Day, and enjoy all of it's health benefits and deliciousness! Preheat oven to 375°F. Prepare a glass 9" pie plate with nonstick spray. In a medium skillet, heat olive oil; sauté Swiss chard, onions, and bell pepper until tender. In medium bowl, whisk milk and eggs. Add in cheese, garlic powder, and pepper. 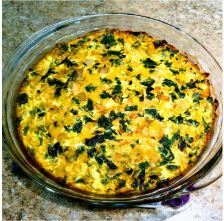 Fold the chard, onion and pepper mixture into the egg mixture and pour into pie plate. Bake until set, about 40-45 minutes or until knife inserted near the center comes out clean.